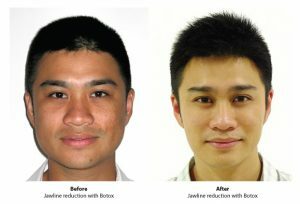 Reduction in the jawline in a man Copyright Dr Siew Tuck Wah,The Sloane Clinic,Singapore. An Enlarged Jawline is usually caused by an enlargement of the Masseter muscle which can make your jaw look square. The enlargement can also be caused by fat in your cheeks. Up till now the only treatment has been Botox to reduce the muscle volume, but now there is Aqualyx, a permanent fat dissolving injection to reduce the fat. Treatment with Aqualyx – Many people will have had Botox for Masseter Reduction, but if you want to explore Aqualyx treatment to reduce the fat pads can be part of the cause for the chubby appearance you will need a consultation to be assessed for suitability. This can be done either as a separate appointment or when you come in for a Botox treatment. A quick test is to clench your jaw and see if you can pinch your lower cheeks between your finger and thumb. A large masseter muscle makes your jaw look square. A square jaw can actually look good on some men. In fact the band of muscle below the eye also gives a somewhat manly character. But it’s a different matter if it is too square, especially if you are a woman for it takes away that feminine oval face. Botox blocks the action of the Masseter at the sites of the injection and this causes a reduction in muscle size over time because the muscle is not being used. For those with bruxism, they notice the pain decreasing within a week. You will generally notice softening of the jawline at 2 weeks and softening of the jawline over the next 4 weeks. Researchers have observed that with continued treatment the reduced power of the muscle can actually allow the body to remodel the bone shape, so that your softer jawline is due both to muscle volume reduction and a change in your jaw shape to a more feminine line. The effects can be truly remarkable. Dr Blatchley’s method for Botox injection into the masseter is quick and painless, and with no downtime. The Botox takes about a week to begin to take effect, when you will first feel some softness of the masseter muscle at the site of the injections when you clench your jaw. Then over the next 4 weeks the softened muscle will reduce in size because it is no longer being used (a bit like being weightless in space), and you will see a lessening of the squareness of your jaw. You may require a second initial treatment at 6 weeks, but generally this is not necessary. 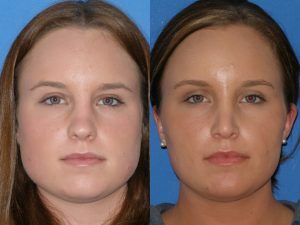 The effects of the botox in weakening the muscle last about 3-4 months, but very often the effects of the botox last far longer and many people find they only require a repeat treatment about once a year before the masseter volume begins to increase again.